Marianne Muzio got hooked on tennis when she took lessons after moving to Silveridge. Now she’s vice president of the tennis club. always plenty to talk about after the final point is scored. “People tell us Silveridge is one of the friendliest parks in the league,” says Brona Freeman, East Valley Senior Tennis League secretary/treasurer who lives at Silveridge. “People like to come here to play because we try to be good hosts. The entire environment is welcoming.” After the last set, coffee and snacks are served so everyone has a chance to visit and relive the games. The park has four courts available. Two are lighted for evening play. Several times a year, free lessons are offered to beginners. For players who want to improve their game, there are coaches for each team. Everyone is willing to help you succeed and enjoy a new activity. 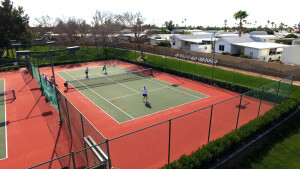 Silveridge’s tennis club is one of sixteen that make up the East Valley Senior Tennis League’s 3,000 member roster, making it the largest senior league in the country. While league play ends in early March, there are four large tournaments after that. Medals will be given for first, second and third place winners, plus prizes. Look for updates and photos at the residents’ section of the park website (silveridge.com/sun). Tennis is good for mind and body. In a friendly game, tennis players burn more calories than golfers or skaters would in the same amount of time. During competition, calories go up in flames even faster-more than you’d melt during an aerobics class. Burning those calories builds stronger muscle and bone. Tennis improves balance and coordination. Being agile on the court gives you a better chance of staying on your feet if you do trip or slip. An hour’s play can burn 600 calories for men and over 400 for women. It’s not just your body that benefits. Working out in the gym means you can watch TV as you exercise or just let your mind wander. Not so with tennis which works the body and mind simultaneously. Tennis requires creativity, planning and quick decisions as well as being quick on your feet. Scientists believe tactical thinking during a game improves cognitive thinking on and off the court. In baseball, you only get a skinny stick to bat at the ball. In tennis, you get a racquet which has a greater surface area, increasing your odds of connecting with the ball and getting it over the net. Tennis is a great way to improve eye-hand coordination while moving your feet at the same time. There are people willing to teach you the how-to’s of tennis. Once you get the hang of it, you can learn ways to improve your skills. If you play with somebody who’s just a little better than you are, it will encourage you to step up your game too. You can start at any age. Why not now?